r. Richard Sayre keeps his plate full as both the Director of the Enterprise Rent-A-Car Institute for Renewable Fuels at the Donald Danforth Plant Science Center, and as the CTO of the high profile algae startup, Phycal, Inc. Recently, he also co-chaired the 1st International Conference on Algal Biomass, Biofuels, and Bioproducts held in St. Louis, MO. 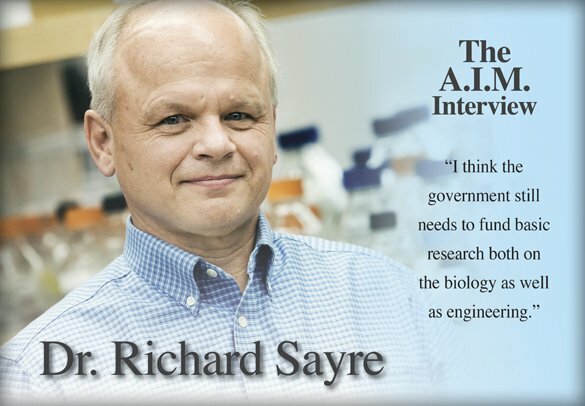 Dr. Sayre has a long history as an innovator in the plant science field. After receiving his B.A. in Biology, in 1974, from Humboldt State University in California, he went on to get his Ph. D in Biology at the University of Iowa, where he focused on the biochemistry of photosynthesis. From then on Dr. Sayre’s research focused on plants. He did postdoctoral work at several universities and eventually found his way to the Departments of Biochemistry and of Plant Biology at Ohio State University in 1985. During that time, he served on the boards of many different organizations dealing with plant biology, and his work earned him the title of one of the “Five Crop Researchers Who Could Change the World” in the journal Nature. In 2008, Dr. Sayre joined the Danforth Plant Center team where, in 2009, he became Director of the Center for Advanced Biofuel Systems, a DOE Energy Frontier Research Center, and in 2010, the Scientific Director of the National Alliance for Advanced Biofuels and Bioproducts (NAABB), a $70 million DOE-funded consortium whose goal is to optimize algal biofuel production along all steps of the process. Over a year into this project, he was kind enough to take time out of his hectic schedule during the conference to answer a few questions about his many projects designed to bring algal-based biofuels closer to practicality. Regarding NAABB, are you satisfied with the consortia’s progress to date, and what are some of the highlights at this point? I think we’ve made tremendous progress in the past sixteen months. For the algal biology team, we’ve completed the genome sequences of our two production strains, Nannochloropsis and Chlorella. We’ve also developed a gene annotation tool with our collaborators, probably the most sophisticated software program developed to date to identify genes in microalgae. On the cultivation side, the arid raceway system that is operating out of the University of Arizona has been online for some time and we have been monitoring its performance. The bottom line is that this system is much more productive than open pond systems in hot, dry environments. It achieves its enhanced productivities by capturing heat of the water basin so that at night the heat loss is substantially reduced. Therefore, the algae are starting off at a much more optimal temperature for growth in the morning. Also on the cultivation side, we’ve developed a laboratory-scale photobioreactor system that mimics the environment of the ponds. Now we can use these modular photobioreactors systems to screen for algae that are good producers under different environmental situations much more accurately than any other system developed to date. We also have a ceramic membrane filtering technology for harvesting algae that has high volumetric throughput, greater than 300 liters per square meter per hour. That technology is also promising because as the membrane fouls, the fact that it is a ceramic technology means that we can clean it by burning off the biofouling agents and reuse it over and over again. That looks promising in terms of cost savings. In addition, we are using acoustic focusing technologies developed at Los Alamos National Labs to efficiently harvest algae in a continuous flow process. What do you anticipate will be the key developments to reduce the costs to manufacture algal biofuel and when do you expect to see them? I think the most important issue is actually productivity of the algae, and perhaps the second most important issue is reducing harvesting costs. On the production side, it’s not only increasing the biomass per unit of land area, but also the lipid content. We are learning more and more about how to regulate those processes at a molecular level. On the harvesting side, anything that we can do to reduce the energy inputs is going to be a tremendous cost saving. 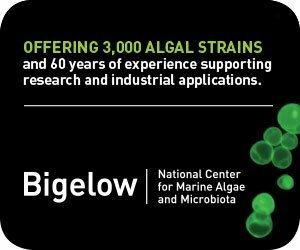 It’s been estimated that as much as 30% of the costs of producing fuels from algae is actually associated with the harvesting. I think some of the promising technologies that we are developing, particularly acoustic focusing can substantially reduce those costs. What do you feel would be the optimum government policy at this time to successfully promote the development of the algae biofuels industry? I think the government still needs to fund basic research both on the biology as well as engineering. There are still a number of constraints that we need to address to make this industry successful and those are going to require innovation at all levels and at the interfaces of different disciplines. I think another element is helping this emerging industry get off the ground and moving. The Department of Energy, Department of Defense, and USDA have made some initial investments helping to commercialize the industry. But what we are finding is that while those seed monies are very helpful, the companies that have received them are now in a stage where they need the larger investments to go to the next level. The challenge there is that the financial community really hasn’t provided the level of funding for that to occur. If the government perhaps could provide loan guarantees to financial institutions, I think that would reduce the risk that they see associated with it, or at least the concern over a longer-term investment, and that would help the industry get going. In your opinion, what is the biggest friction point in the development of this industry? Well, I think what’s perhaps most unfortunate in a sense about the development of this industry is that occasionally the pronouncements on what is possible with this industry far exceed what’s actually theoretically achievable. So the industry has to some degree hurt itself by making claims that cannot be realized. I think it’s going to be very important to recognize what are the limits here. For example, what are the potential productivities? What are the realistic costs involved in doing this? We need to agree on what those numbers are and then move forward from that. Some claims that are being made by startups are just unrealistic. At the 1st International Conference on Algal Biomass, Biofuels, and Bioproducts we have heard a lot about heterotrophic, autotrophic, and mixotrophic models. Where do you see each of these production methods place being in the algae industry? If we start with the heterotrophic model, it has the largest capital and operating expenses. So I think the heterotrophic system is most likely going to be successful at producing high value products. The autotrophic model, while being perhaps the least capital intensive and with the lowest operating expenses, has the issue of yield and the time to produce that yield. One important strength that it has is the ability to capture carbon dioxide and use wastewater nutrients. From a sustainability perspective, it’s probably the most attractive of the three models. The mixotrophic model is of course the combination of both the heterotrophic and the autotrophic. Mixotrophic systems can capture carbon dioxide, recycle wastewater, but it has the upside that it can get tremendous boosts in oil production in a very short period of time by feeding plant-based sugars to the algae. I think the balance between autotrophy and heterotrophy in a mixotrophic system can potentially be optimized to achieve the greatest productivities at the lowest cost margins. The other potential advantage of this hybrid system is that we can temporally separate the biomass production from oil production. You can therefore optimize your biology and production strains so that you can have ponds that generate massive amounts of biomass and then, when it goes into the heterotrophic system and there is a shift to accumulate oil optimize oil production and suppress biomass accumulation. I tend to favor the hybrid system because I think it gives you the greatest flexibility. 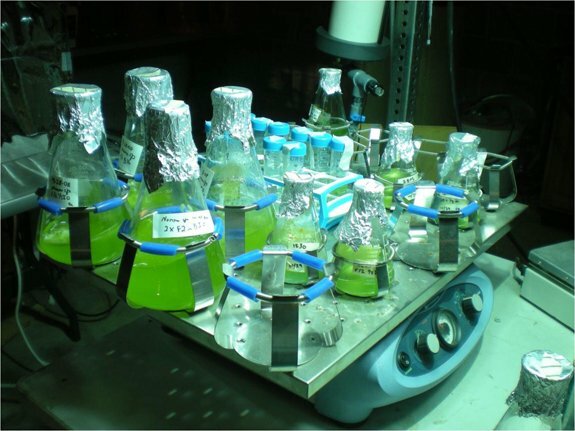 Part of your research deals with algae light absorption. Can you briefly explain the importance of this research and any breakthroughs you may have had? It’s well recognized that photosynthesis is a very inefficient process. Crop plants’ efficiencies do not really exceed 5 or 6 percent for conversion of the total solar spectrum into chemical energy. One of the major components where we see the greatest inefficiencies is the harvesting of the light energy. The pigments that harvest light energy do not harvest all colors of light. We think there are some opportunities there to increase portions of the spectrum that are available in sunlight to drive photosynthesis. That’s a challenging problem. It’s going to take a few years to figure out how to do that. A much simpler approach is actually to change the number of pigments that are capturing that energy. Plants and algae are light hogs and harvest more energy than they actually can use. We think they do that because it allows them a competitive advantage by shading out other competing organisms. So if we optimize it so that all the light that is captured is converted into chemical energy, then we have a more efficient photosynthetic system. By combining a reduction of light capturing ability with deeper ponds that contain more organisms, you can capture more light and utilize it as efficiently as possible. You mentioned that there seems to be a tradeoff between biomass production and oil production in algae. How are you addressing this issue? I think that more and more are realizing that there is a tradeoff there. In these organisms, as they take the energy of sunlight and form new chemical bonds, that chemical energy can be used to produce the biomass of the cell, the living organism, or it can be stored in the form of oil. I would like to think that that the ability to temporally separate those two processes in the hybrid system offers us an opportunity to actually optimize the biomass and oil production processes. In the open pond we can enhance photosynthetic efficiency, carbon capture and nutrient reutilization. That will enhance and optimize the biomass yield. As we go into the heterotrophic environment we want to push all the energy in the direction of high-energy storage products such as oil. As we gain more understanding of the regulation of these processes we can optimize them. One approach is to use gene switch technologies, so that once we reach optimal biomass accumulation we turn on or off a set of targeted genes so that metabolism is shifted from biomass to oil production.. Please give us an update on Phycal’s current production status and what developments the company expects over the coming year? Phycal is based in Cleveland, Ohio, and the engineering operations are located there. The molecular biology group is located in St. Louis and there is the pilot plant team that is moving to Oahu. Currently, Phycal has about forty employees. The company has recently received a 50 million dollar award from the DOE to build a pilot plant on Oahu. There, we are partnering with General Electric, the oil refinery Tesoro, and HECO, the Hawaiian Electric Company, to produce biomass and oil that will be combusted in HECO’s electric power generation facilities. The carbon dioxide that is generated both at the refinery and eventually at HECO will be pumped back up to the pond to be recaptured and recycled. Phycal is also working with the US Army military base on Oahu to utilize their wastewater from their sewage treatment plant. So the initial pilot plant will be about 30 acres in size and it will take advantage of a mixotrophic system and utilize sugar that will also be produced onsite using cassava. If this pilot scale plant is successful, we hope to scale up from 100,000 gallons production per year to the next level of 3,000,000 gallons production and, beyond that, 10,000,000 gallons per year. Initially, that will be in Hawaii, an optimal environment in which to grow algae and also potentially a very profitable environment because energy costs are so high there. 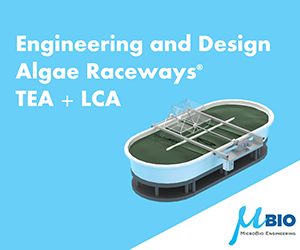 Ultimately, we see this technology moving into the Southeast part of the United States, where we think the environments are ideal for growing algae. Just as a timeline, when do you see all of these different levels taking place? 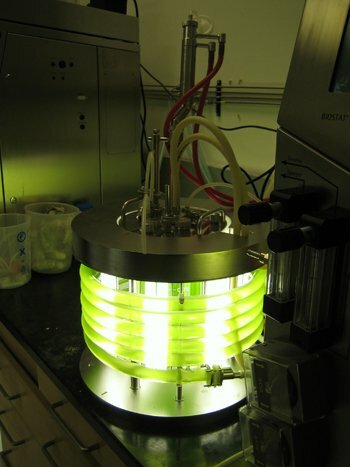 For the demonstration plants, I think within three years we will have a good understanding of what the potentials are for producing fuel using algae. As new technologies come along, and they are moving very fast – it’s very exciting actually to watch this happen, we’ll hopefully get more efficient and more profitable as we go forward. So how far along are your operations in Hawaii? We have secured all the appropriate permits and environmental impact assessments for the technology. We have in place the off-take agreements with our partners for the products and the fuels we will be producing. We anticipate breaking ground before the 1st of the year and hopefully a year from now we will be up and running at full scale. Any final words about the NAABB you’d like to leave us with? What I think is exciting about NAABB is that it integrates all aspects of the industry, from the basic biology through cultivation, harvesting, extraction, conversion, co-products, economics, and sustainability analyses. We are, in a sense, an open access technology organization. We bring in partners we think can add value and what we provide to our corporate partners is an opportunity to share in the intellectual property pool before it becomes publically available. That has proven to be an attractive model not only domestic companies but we’ve had investments from foreign oil companies as well. 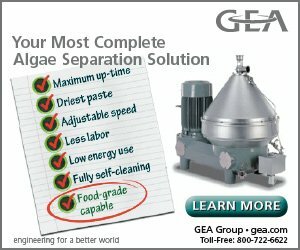 We like this model, and we think it’s the way to go in the future, because to make this program of producing oil successful from algae, you really have to take advantage of the best innovations from all areas of the industry, from the engineering to the biology to the interface between them. That is what NAABB is trying to do in a very public and open way. I think that is an unusual approach and I think it’s going to be a very successful one.